Get a competitive edge with Creative Fatal1ty Gaming Headset. Co-developed with Johnathan "Fatal1ty" Wendel, this headset is designed specifically for gamers to give them a definite edge over the competition. Take your gaming audio to the next level. Know where your enemies are at all times. Sound Blaster X-Fi technology delivers flawless audio and positional 3D effects. The Creative Fatal1ty is lightweight and has a padded adjustable headband for a tailored fit. Circum-aural design cancels out ambient noise reception while the microphone delivers clear commands during gaming or chatting. Simple plug and play technology will have you up and gaming in minutes. 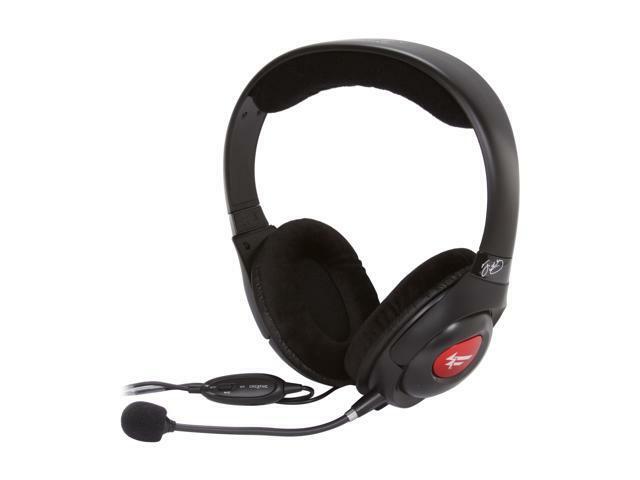 Convenient in-line volume and microphone control allow you to adjust sound to your preference. Hear the frag-fest, the symphony, or even your friend that lives out of state, in tones so rich and clear you would swear you are in the same room. High-quality Sound The Creative Fatal1ty features powerful 40mm neodymium drivers to produce a wide-range frequency response and deep bass sound for a highly immersive listening experience. Wearing Comfort The Creative Fatal1ty features plush velvet earpads and generous head padding for maximum comfort, especially perfect for extended gaming sessions. Noise-cancelling Microphone With the noise-canceling function, the microphone effectively blocks unwanted noise for high speech intelligibility. Convenient In-line Controls With the convenient in-line controls and mute switch, adjust the volume or mute the microphone easily. Pros: It technically functions as a headset, so if you have literally no other options, this can work as your audio. Cons: Absolute garbage mic quality. Flimsy plastic that doesn't allow any real adjustment. The price isn't even that great once you consider how cheap earpods are, and even those have better mic quality. Other Thoughts: The first headset was DOA, so I sent it back. The second one worked, but the quality was so bad I thought something had to be wrong and sent it back again. Third time I realized that these weren't going to get any better and made do with them until I could upgrade to anything else. not a 7.1 sound, etc. Other Thoughts: Bought these super low price maybe $35 over 10 years ago, they are by no means BOSE headphone sounds, but they work and haven't had any issues yet. Still working after three years of constant use but see Cons. Cons: After three years of regular usage, the cable insulation is getting brittle and cracking. It still works at this time, however, I fear that the wire under these cracks will crystallize and break soon. Pros: Very low price (when I caught them on sale). Mic on/off switch of dubious value. Other Thoughts: Picked up two of these when they were at an unbelievably low sale price, then let them sit unused for a couple years. Pulled them out a few days ago for a trial run and found BOTH headsets had the same issue. While the microphones worked well enough, I couldn't get any sound from the headphones! I thought the front panel jacks on my PC were bad! I checked a cheap, junky pair of headphones on the PC jack and they worked fine. Tried the Fatal1ty headsets on my boombox and got barely any sound with the volume knob up all the way! I had also picked up a refurbished Turtle Beach headset a ways back and tried that on my front panel jacks, that headset worked flawlessly. Since the Creative headsets were way beyond any type of warranty, I just threw them out and kicked myself for having wasted the money in the first place (and not having tried them sooner). I can't even begin to recommend them at the obscenely high price advertised now. Cons: Very cheaply made, bad sound, you get what you pay for. Cons: - Price on these has DOUBLED (due to the demand) since I got my first pair more than 5 years ago. At the current price near $70 I would recommend looking for lower priced or better quality headset. - Velvet ear cups, while comfortable, absorb hair and skin oils/dirt over time (even if you think you're a clean person) and are not easy to clean. These deposits can leech out wherever you set these headphones down and leave stains. - The light weight can make them feel fragile. Consider your own personal rage levels while using these. Other Thoughts: I've now owned 2 sets of these in more than 5 years. As stated above, they were amazing at their OLD price point (somewhere between $30-$40). Other companies have copied many aspects of this design and now have headphones at equal quality/comfort at a much lower price. Check around. Pros: The boom mic comes off and is directional which results in better experiences overall. Awesome sound that is very balanced and crisp. The ear pads are super comfortable.